CIRCA 1919 - Men of the 61st Infantry rest in Dulcon; one man gets a haircut. hd00:51CIRCA 1918 - Soldiers travel in mule-drawn wagons on a mountain road in France in World War 1.
hd01:22CIRCA 1916 - Mexican revolutionary forces are shown in combat and US Army officers survey seized weapons during the Pancho Villa Expedition. hd01:28CIRCA 1950s - United Nations Troops advance closer to the 38th parallel in Korea in March, 1951, checking for land mines and repairing roads on the way. 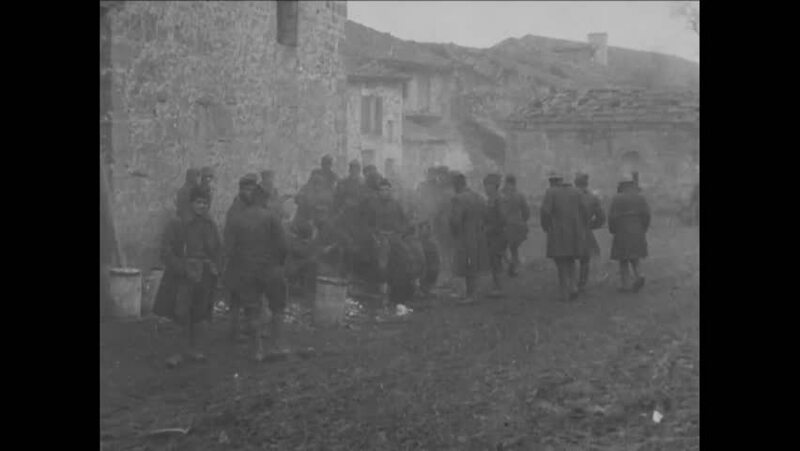 hd00:45CIRCA 1917 - US Marines receive supplies from the Red Cross and others while in France. hd00:47CIRCA 1916 - Federal gunners fire weapons and a corpse and a carcass are shown during the Pancho Villa Expedition. hd01:04CIRCA - 1918 - Soldiers in the 42nd Division perform an exercise where they run with artillery equipment. hd00:31CIRCA 1918 - French civilians greet 6th Infantry troops in gratitude after the WWI armistice has been announced. hd01:47CIRCA 1918 - Secretary of War Newton Diehl Baker visits the 166th Infantry at an aid station in the Luneville Sector of France during World War 1.